The "Shakshuka" System is the story of the Israeli journalist, Miki Rosenthal, and his attempt to understand the "behind the scenes relationship between money and government" in Israel. This is the system whereby the government sells its limited resources, cheaply, to a handful of wealthy families. Rosenthal, together with the director and photographer, Ilan Aboodi, chooses a difficult mission – he must track down several complicated multi-billion sheqel deals between the Ofer family, one of Israel's top ten wealthiest families, and the government. Part of the wealth of the Ofer family is the result of its partnership with the government which afforded the family very nice profits and represented significant loss to the state. 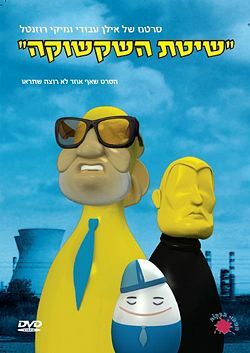 As it turns out, no one really wants to talk to Rosenthal and Aboodi – no one from the Ofer family or, for that matter, not anyone of the government officials and politicians involved in the privatization or other deals mentioned in the movie. During three years of documentation, Rosenthal uncovers the frightening image of a country which sold its assets cheaply to its wealthiest families, allowing them to pollute the air and take advantage of expensive natural resources. He then shows how several of the officials, upon terminating their work for the government, were employed by the Ofer family. Rosenthal gets deeper and deeper in trouble. While the movie is being shot, the Ofer family files a law suit against him. As a result, there is no cultural fund or company willing to support him or finance his movie and the television channel which was supposed to show the film now refuses to do so. The Ofer family becomes the main owner of television Channel Two where Rosenthal has been working, and he quickly finds himself out of a job. Rosenthal goes into debt trying to finance the movie and puts his family's future at risk but he cannot stop. He has chosen to obey the voice of his journalistic conscience.